For email marketing, the practice of “batch and blast” is dated. Companies should move beyond this strategy, into a segmented email approach that is more relevant to each individual subscriber and increases the overall effectiveness of an email-marketing program. But where do you start with email segmentation and what strategy makes sense for your company? I address those questions in this article. The first step is to analyze your email database and the information you store about your subscribers. Once you understand the different types of subscribers and customers, establish the size of potential segments to identify groups that are large enough to group together, but small enough that they share common characteristics. Here are four potential segments to consider. A basic but effective way to split your email database is between buyers and non-buyers. Your communication, offer and frequency should differ for these two groups, which can further be broken down as follows. Here’s an email from Amazon, segmented by past buying behavior. It targets customers who have purchased biography books. 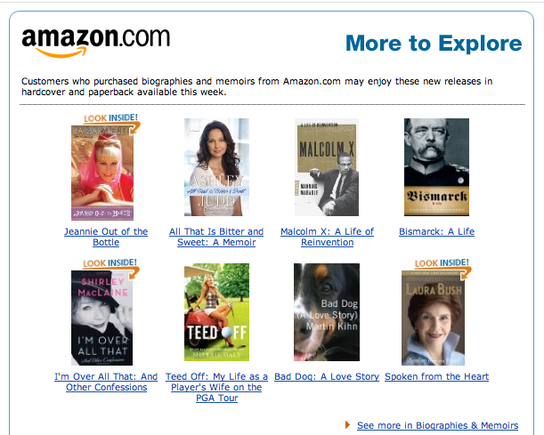 Email from Amazon.com targets buyers of biography books. For non-buyers, look at how long they have been a subscriber and segment based on that information. Your ultimate goal will be to convert non-buyers into buyers and infrequent buyers into frequent ones. Demographic information — such as likes, interests, gender, and geographic location — can be a terrific segmenting tool. For example, sending an email to men two weeks before Valentine’s Day reminding them about a 20 percent off jewelry sale will most likely be a better performing campaign than sending to your entire database. 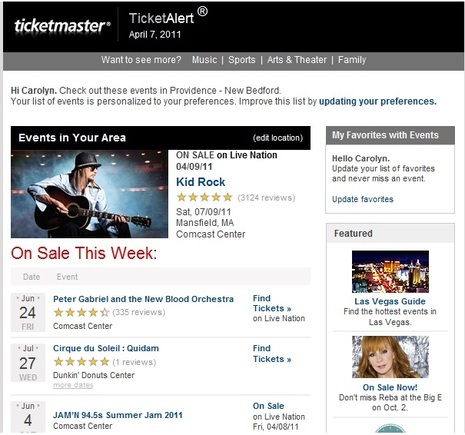 Here’s an email I received from Ticketmaster, the retailer of event tickets. The email is segmented by geographic location — concerts in my region. Email from Ticketmaster segments by geographic location. If you can track opens and clicks over a period of time, segment that to separate those who are currently engaged in your brand and those who are not. Segmenting based on opens and clicks helps write subject for those who have not opened or responded to an email in awhile. Also, treat these groups differently in terms of frequency. Non-responders will be less tolerant of a higher frequency than those who actively open and engage. Combining two or more groups can be an effective strategy. For example, adding buyers who have purchased in the last three months to those new subscribers who have not yet purchased — but are opening your emails — will create a very responsive group, based on my experience. Determine the groups that make sense together to increase the size of your segments. Effectively segmenting and creating unique messages will no doubt increase your email marketing performance. However, remember the additional time and resources needed to do this. Monitor the return on investment to optimize your time and effort, and to determine the level of segmentation that makes sense for your company. Whatever you do, keep your email subscribers engaged in content that is relevant and valuable to them. Base your message, offer, subject line, and creative message with the end user in mind.